yeah it was a cool doc. I was actually driving and as usual flicked on radio 4 on the off chance (so rare) there would be something interesting to listen to. Its not often you hear something like this on day time radio 4. Might I recommnend SoundCapture, then. It records everything that goes through your sound card and delivers an mp3. A jolly little device but be careful of the record level. Mine's set at around 3 or 4 marker points up from the left (i.e. quit low). Sorry dude, but I thought the documentary was lame. Spandau have f all to do with electronic music and none of the interviews say much more than "he turned up with this box and it sounded like a drummer." 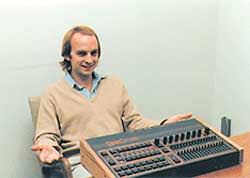 It was fun to hear Roger Linn programming a Linn drum though, talk about a feeble pattern! And as for Gary Kemp's pathetic attempt to make the Spands into elektronische pioneers! things like the this are why musicthing is the only blog i visit. trace the actual significance of less respected aspects of creating music. anyone have a recording of this?